Northeastern Siberia is a land of vast expanses and great contrasts, a land cut in half by the Arctic Circle. It is a land of high mountains and deep valleys, vast plains and snowy tundras, merciless winds and blinding blizzards, long white nights and black days, numbing cold and intense heat, a land of feast and famine. Dogs were held in high esteem by the people that lived in this land because their existence often depended upon their sled dogs. These sled dogs were the ancestors of the present day Seppala Siberian Sleddog. In 1908 William Goosak, a Russian fur buyer from northeastern Siberia, brought a team of 10 Siberian sled dogs to Nome, Alaska. They finished third in the All-Alaska Sweepstakes race of 1909. 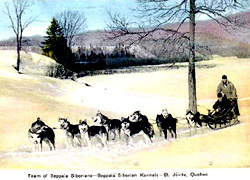 Over the next 10 years a number of additional Siberian sled dogs were imported, and Siberian sled dog teams, driven by John "Iron Man" Johnson and Leonard Seppala, dominated the All-Alaskan Sweepstakes races. In January of 1925, a child in Nome died of diphtheria. It was imperative that serum be brought in, at once. It was mid-winter and the only way to get serum to Nome was by dog team. A relay was set-up to cover the 658 miles from Nenana to Nome. The primary cog in this relay was a team of Siberian sled dogs driven by Leonard Seppala. With temperatures hovering around 30 below, over hazardous ice and rough mountainous terrain, Seppala drove his team approximately 260 miles over a 5 day period to get the serum to Nome. Once again, in relatively modern times, the survival of people depended upon their sled dogs. This, then, is the heritage of the Seppala Siberian Sleddog. He is a working dog of moderate size specifically adapted in temperament and physical construction to the needs of rapid long distance dog sled transport with a light load in a cold arctic climate. This includes sled dog racing.